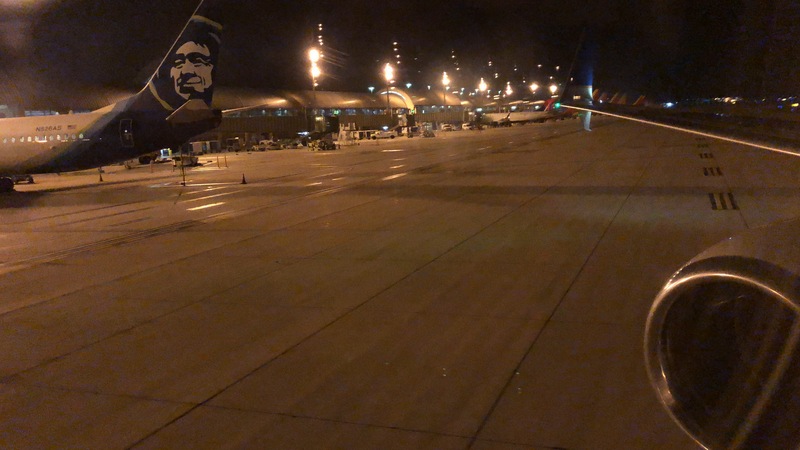 I didn’t have to go very far after arriving on my previous flight from Toronto because I was flying to SNA on the exact same aircraft! What are the chances?! 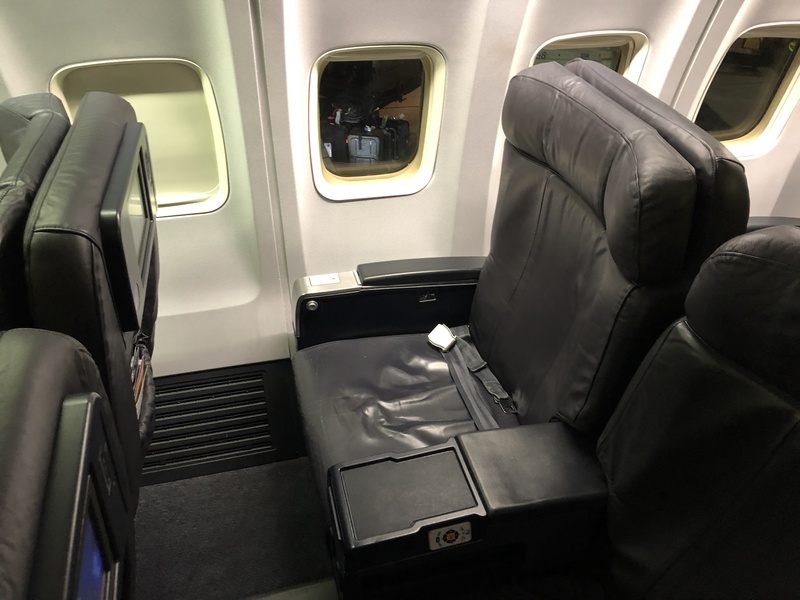 After boarding, I turned right into the First class cabin which was 4 rows of wide recliner seats in a 2-2 configuration. 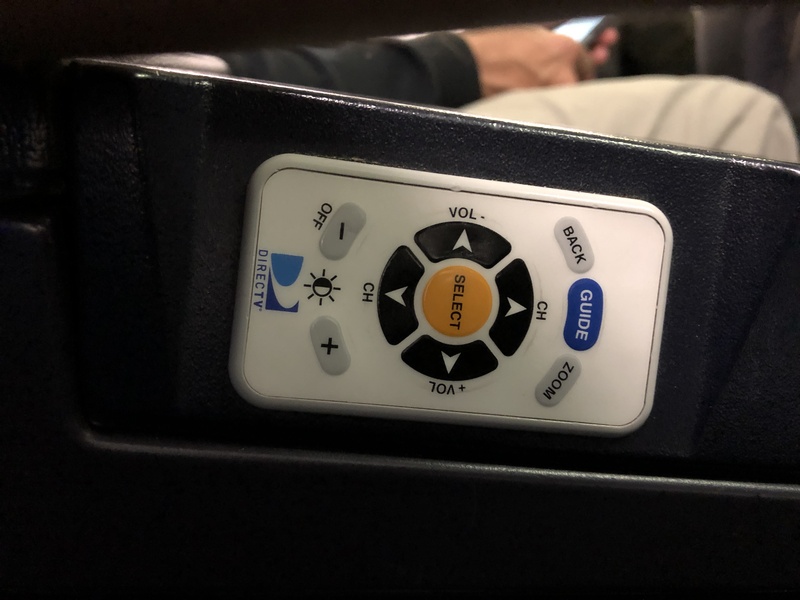 I was in seat 3F on this one. Now I went into great depth on this seat in my previous flight, so I’ll just highlight the important parts again. The seat is very wide which is nice, however its hard which is not so nice. 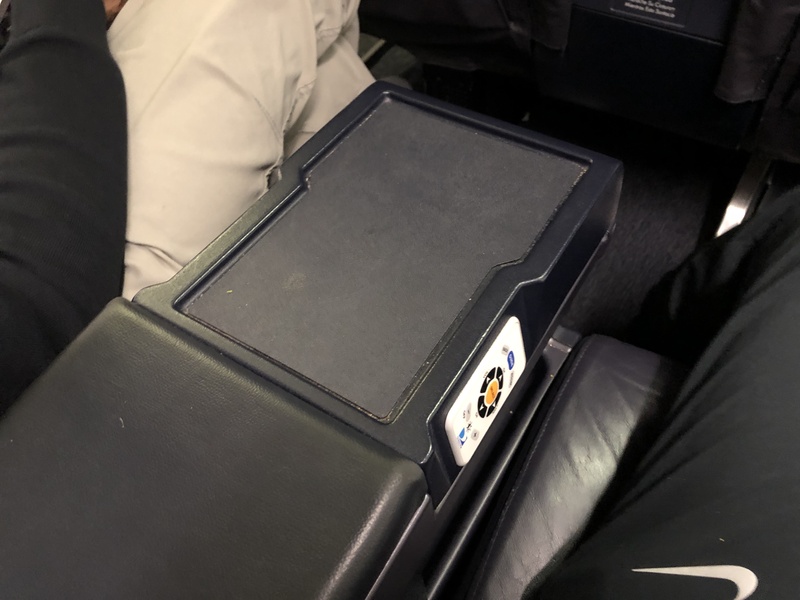 The center console was big enough for you and your seatmate to store drinks. There was also a remote on either side of the console. 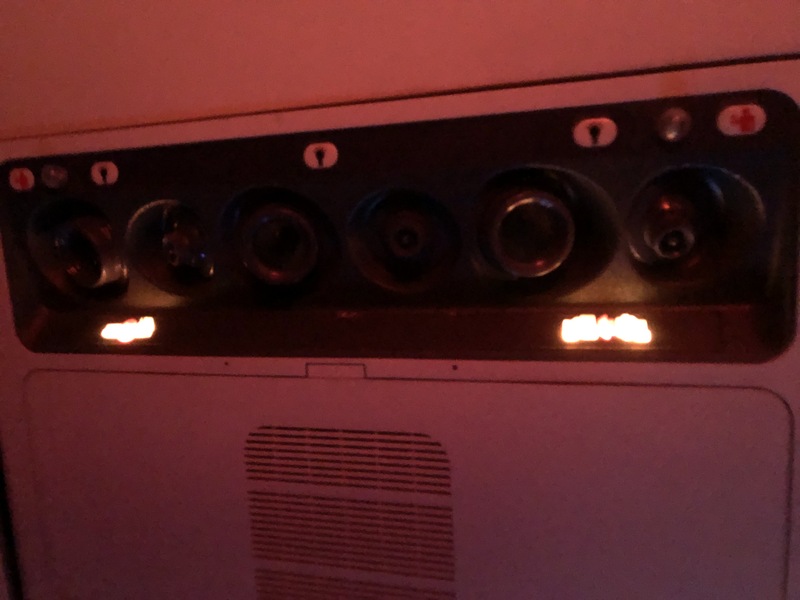 There’s also overhead air nozzles and lights which I greatly appreciate. 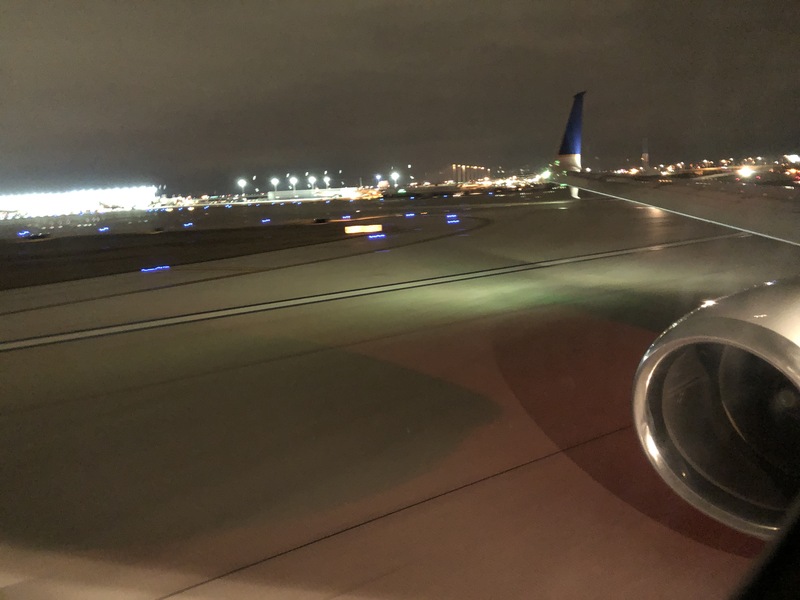 I’d say I also had a better view of the wing, even though the light was on here. If it wasn’t a coincidence enough to have the same plane as what I did on my last flight, the purser, Elan, was the exact same as well which was a pretty cool coincidence. He was great on the last flight which was under 2 hours, so now I was happy to have him on a flight longer than 4 hours. 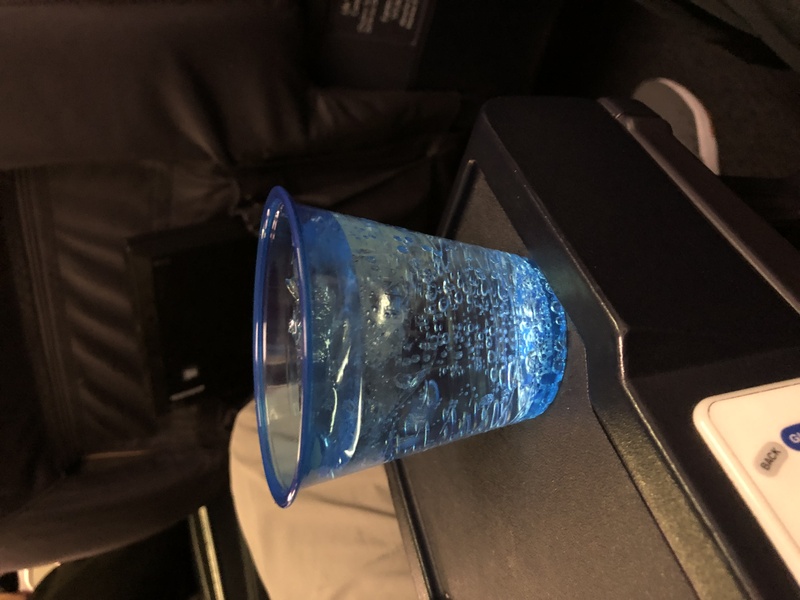 He came around taking orders for pre-departure beverages as soon as all the first class passengers were seated and I went with sparkling water. 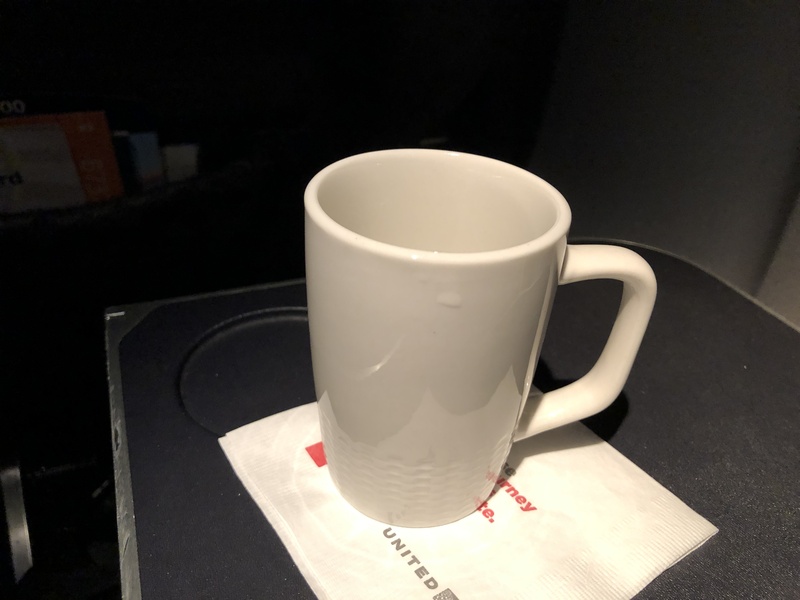 If I give United and other US carriers enough trouble for using plastic cups pre-departure, I have to at least give UA credit for offering a choice, unlike many other carriers that just give a few choices. 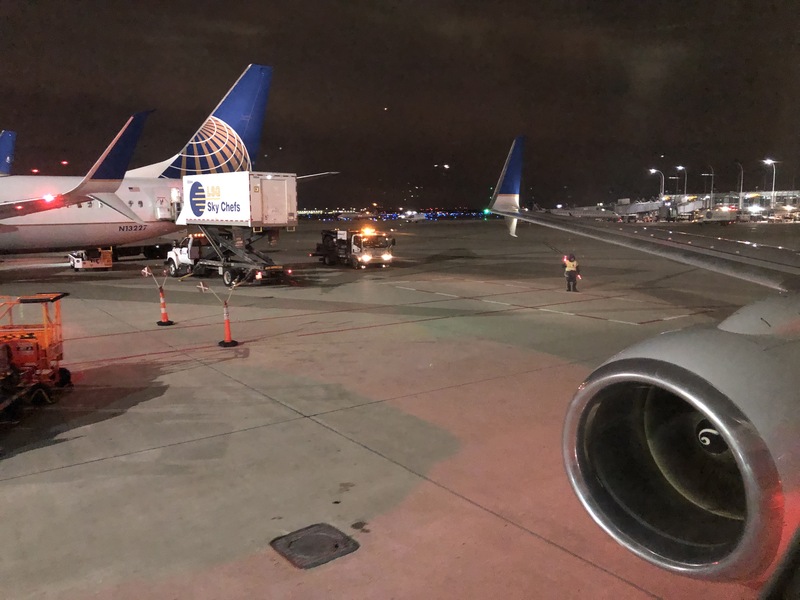 After Elan’s pre-departure announcements, we pushed back and started up our engines. Soon enough we had a quick taxi to our departure runway. 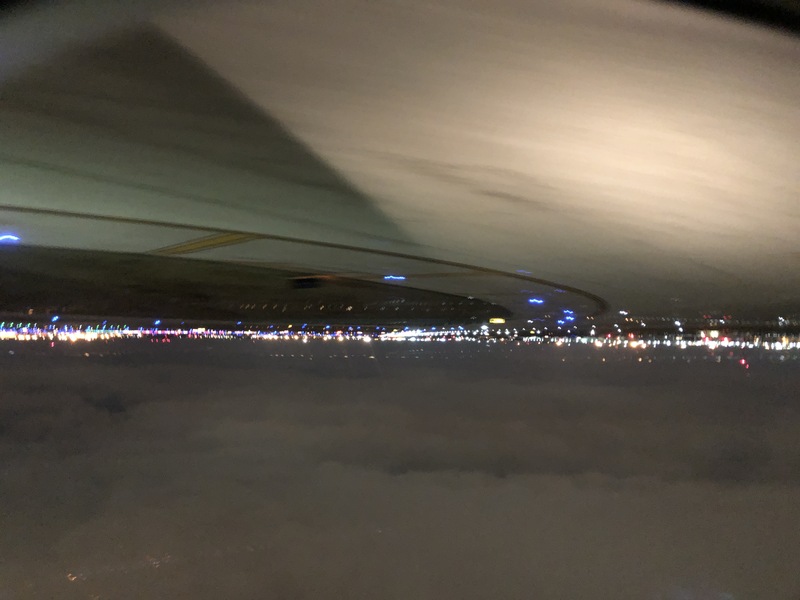 We had a very long takeoff roll and an initially slow climb out of Chicago. 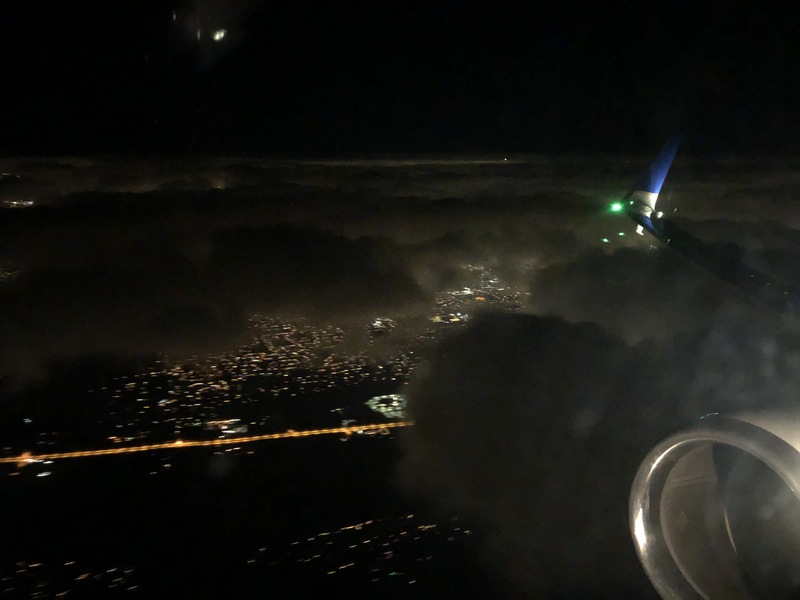 we climbed through a small cloud layer, and it was clear skies for the rest of the flight. 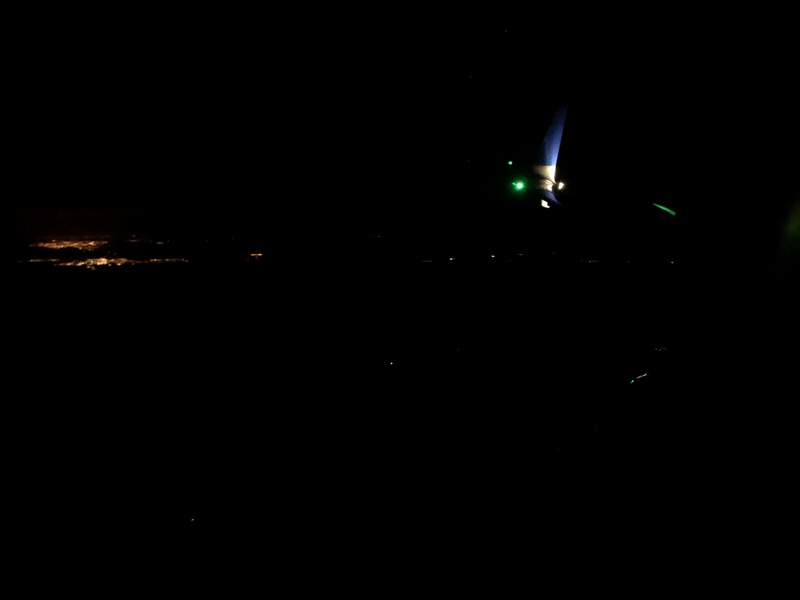 Shortly after the captain turned the seat belts signs off, he gave his welcome announcement and the crew got to work. 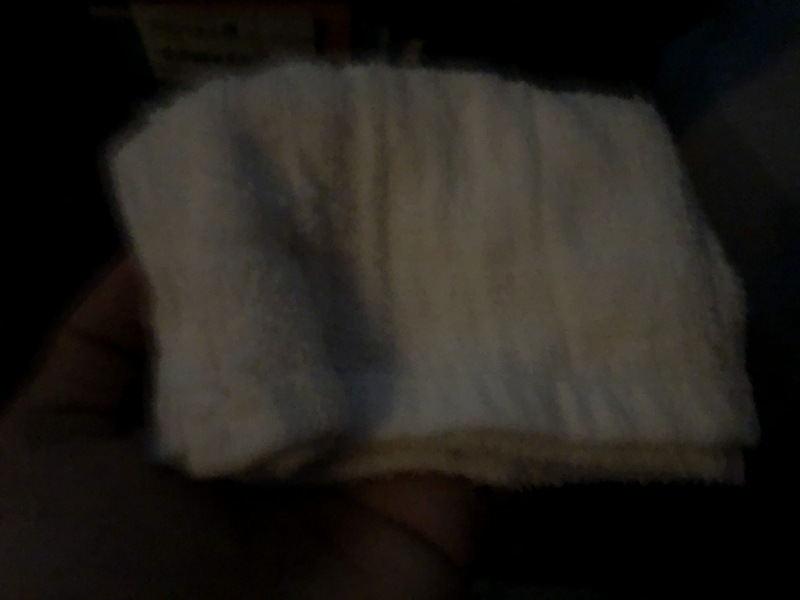 Another crew member came around with hot towels. I went with the cider glazed chicken. 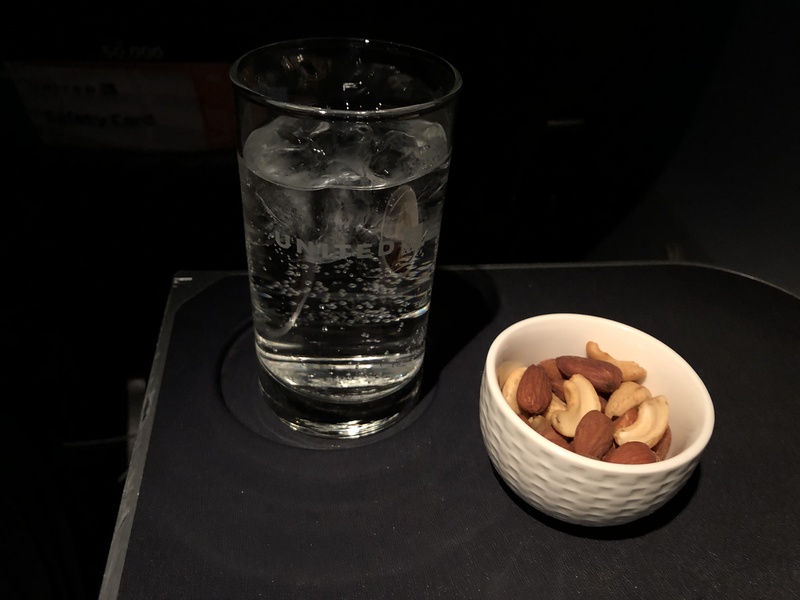 About 50 minutes into the flight, Elan came around with drinks and nuts that we wanted to start off with as well. I went with the usual sparkling water. And, of all, he did all of this with a smile on his face. He was definitely happy to be there. 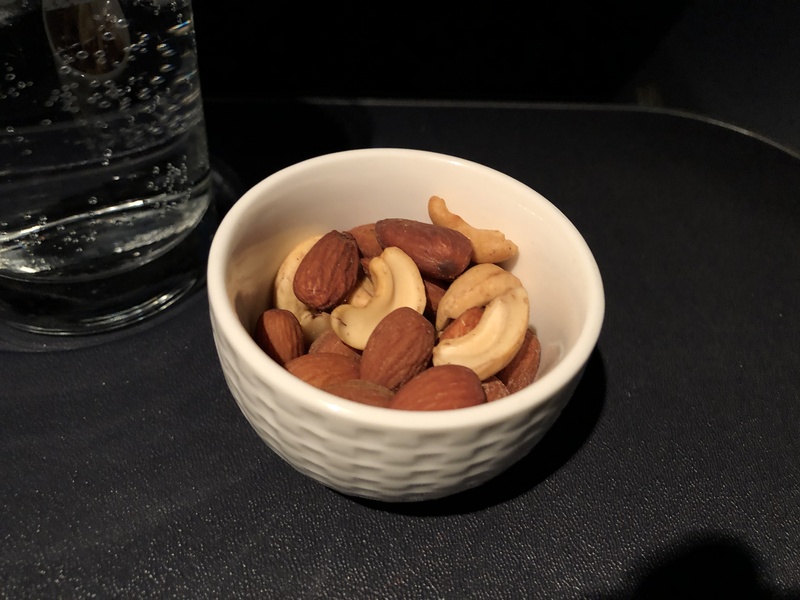 The nuts were mildly warm and was the standard affair of what UA served which is simply a mix of almonds and cashews. Service was pretty slow across the board but I can’t blame Elan. There was one of him serving 16 of us. 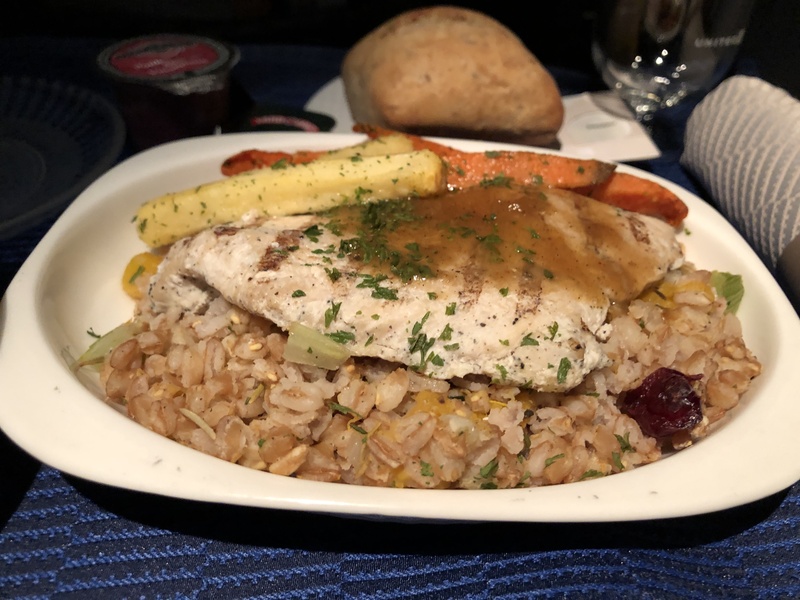 Dinner was served about an hour into the flight and the flow of service sped up once another crew member came from economy class to help. The main course was honestly mediocre. The rice that was “seasoned” was quite bland and overcooked. The chicken was on the tougher side however it wasn’t that bad for a chicken heated in the air. The chicken was also bland which was expected but even the “cider glaze” on top was bland. 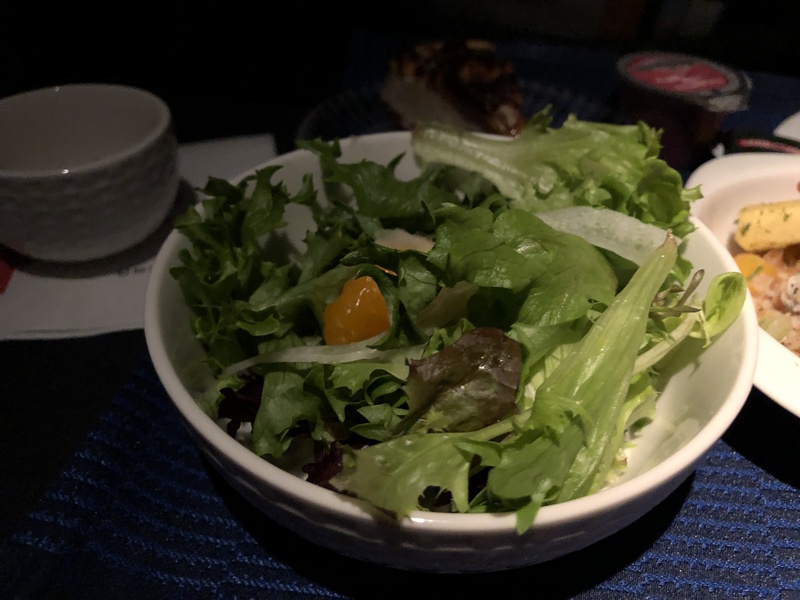 The salad with the acai vinaigrette was actually quite nice. It was sweet & tangy, and mixed with the orange already in the salad made for a tasty combo. Then there was UA’s usual cheesecake affair. They never fail to disappoint with these things and today was any other day. 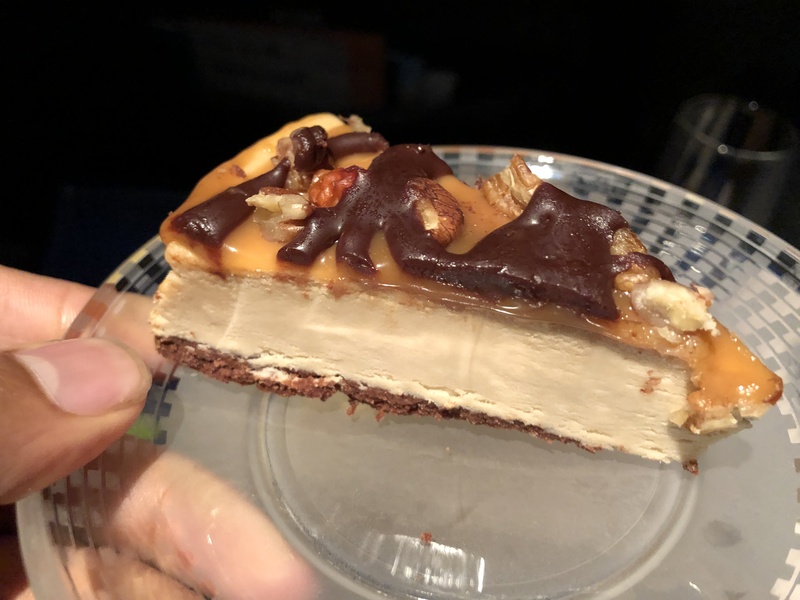 It was tasty, sweet, crunch with the nuts, and had everything I wanted in a dessert. 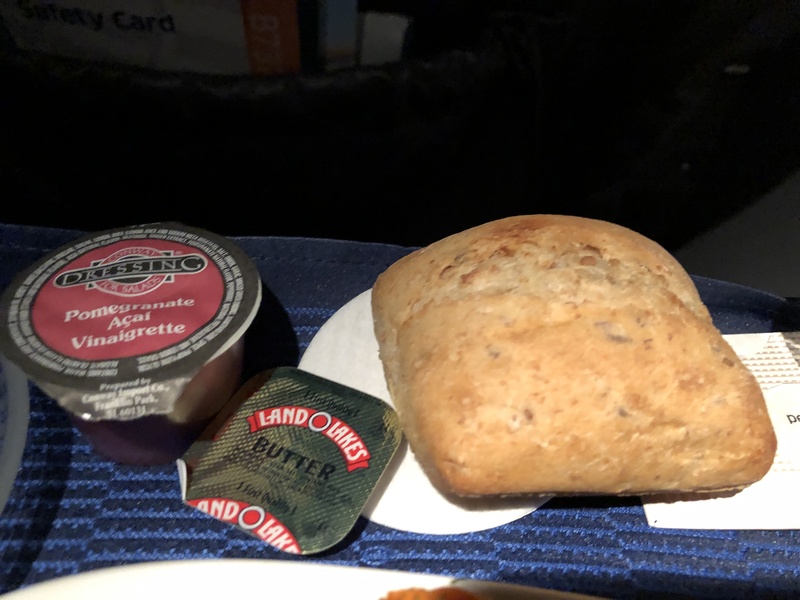 The bread was lukewarm but too hard to eat. 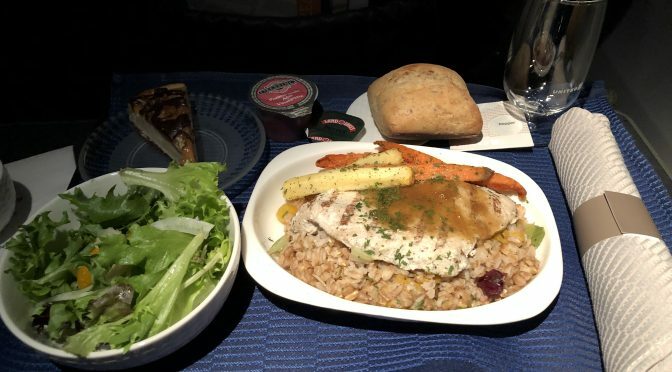 Honestly, I wasn’t too impressed or happy with the meal, but after all, it was basically just business as usual for what to expect on a domestic flight. After dinner, Elan asked if I wanted anything else to which I just went with hot water. Overall, the food was just about ok, but the service was exceptional. 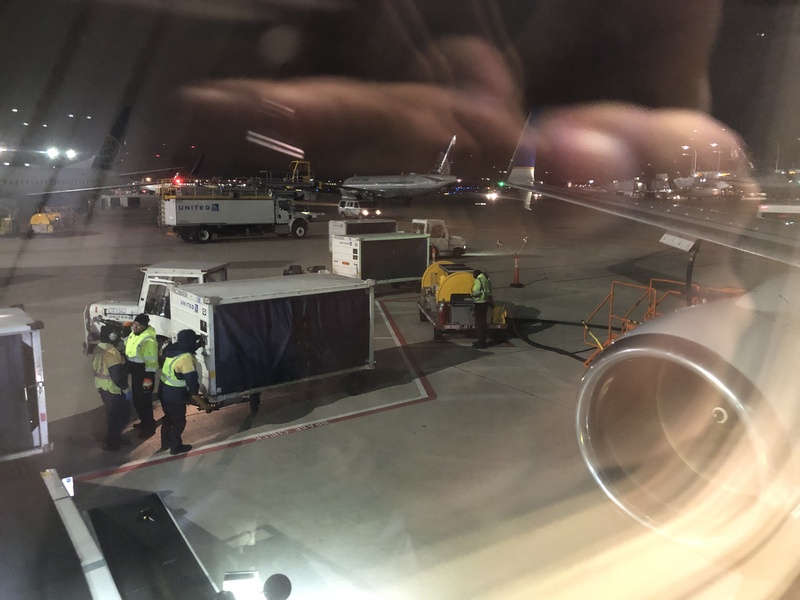 Elan was hustling back and forth, proactively refilling everyone’s drinks, making conversation in between, and doing everything you’d expect to have your flight be personalized even with a 1:16 crew/passenger ratio. I went to use the bathroom after this, and it was standard as you’d expect. After this, I crashed for the rest of the flight…..more easily than I had ever done before. I mean I think I’ve had the longest day of my life on this day. I started the day at 5 AM London time waiting on this flight for being late, then running to this flight, then running across terminals to this flight, and then to this one. By this time, I’d had nearly a 24 hour day. But anyways, in the time I was sleeping, Elan cleared my tray and hot water glass. 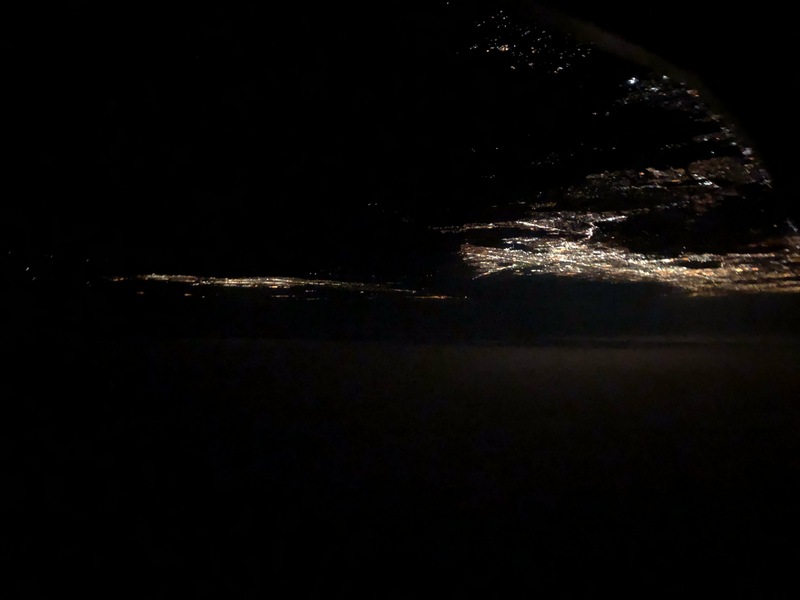 I woke up to the captain’s descent announcement and as I looked out the window, I could see the LA basin starting to appear. 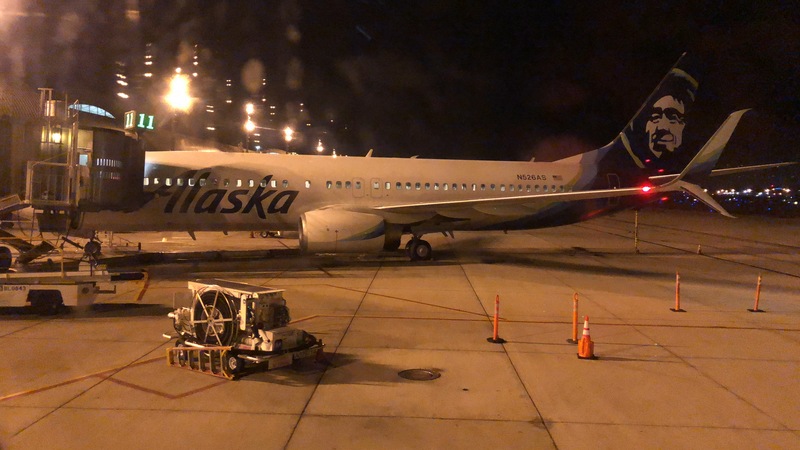 We had a smooth touchdown on runway 20R and a quick taxi to our gate next to an Alaska 737. 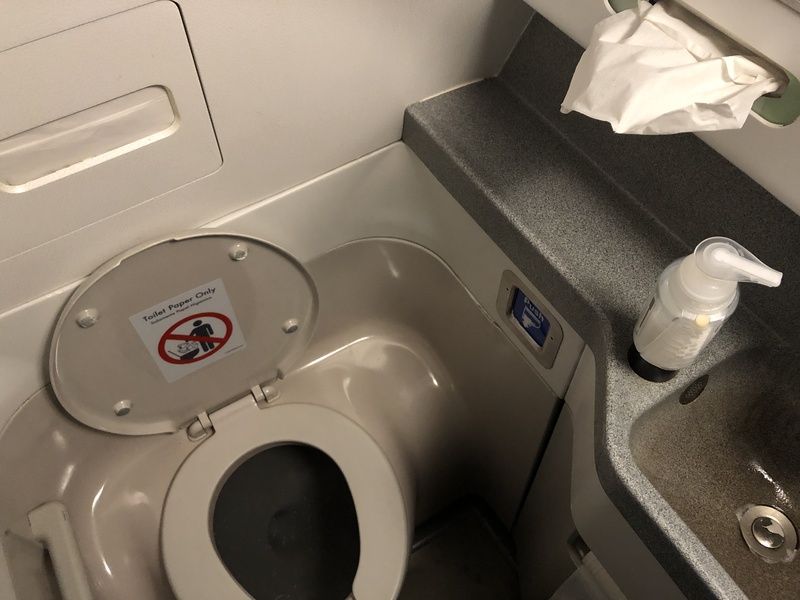 Well, this was just another example of what you’d expect on a UA flight. 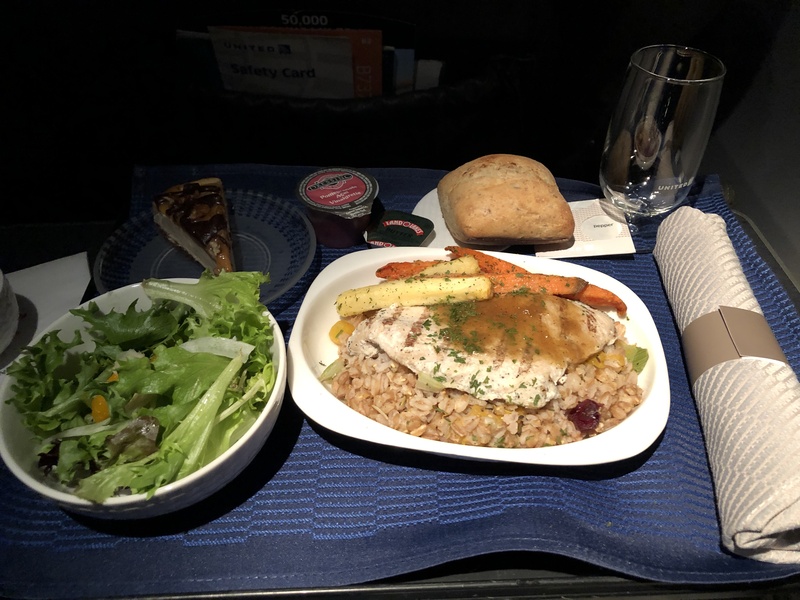 The seats were ok, the food was ok, the flight was ok. but Elan the purser made the flight better than what it should’ve been. So thank you to Elan for making the flight enjoyable and allowing a relaxing finish to this misfortune-driven return journey. 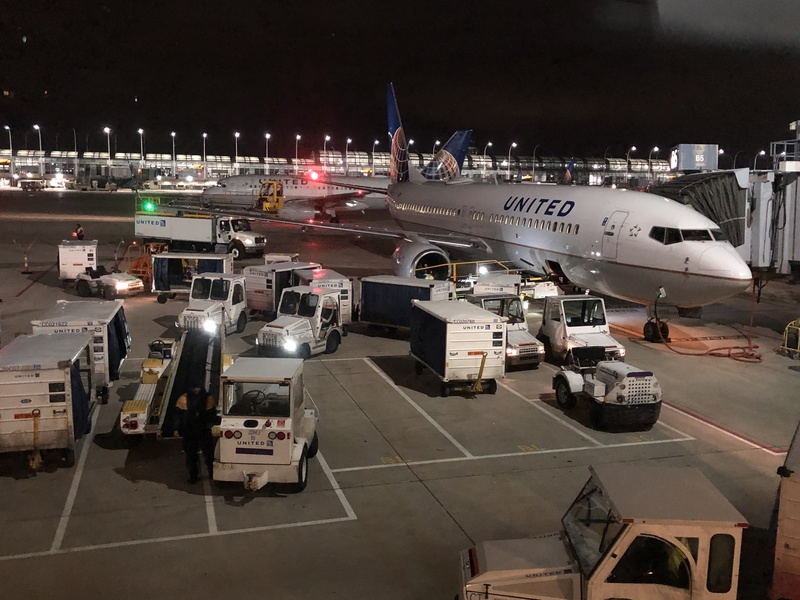 Will I fly UA again in domestic first? Probably at some point, but it will always be the same average product that it has been and nothing will change that. It would certainly help to have a widebody on a domestic route, but whatever there is. Thanks again for following along another fun trip and hope you enjoyed this last one for a while. Hope to see you all back for the next major trip, whenever that may be, besides trips in between here and there. In the meantime, take care and cheers!